This is a common situation in our daily lives actually- wrongly delete the desired files or select to erase the data from Google Drive but feel regretful later. And at this moment, the first thing you want to must be recovering the deleted Google Drive files but how to accomplish this goal? Just see here! Here are 4 ways to restore deleted files from Google Drive so you can select one of them to get back the wanted data easily. How to Find Missing Google Drive Files or Data? 1. Find the files in website. Just go to drive.google.com and select My Drive. Then click on Info at the top right corner to get more information. After that, you need to go to Activity and search the information of the missing file in it. 2. The file is deleted by its owner. If the file that you want to find is created by someone else and is deleted or renamed by its owner, you will be unable to find the files. In this case, what you can do is only to look for a new source on internet and re-download it. 3. Use advanced search. Another situation is that you are the owner but the file is in a folder created by others who have deleted the folder. To get back this kind of file, you can use an advanced search “https://drive.google.com/drive/u/0/search?q=is:unorganized%20owner:me” on computer. Step 1. 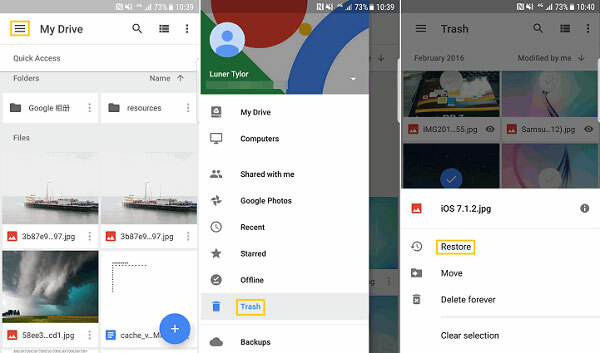 Launch the Google Drive on your Android phone and then select Menu> Trash. Step 2. In the Trash, you will see the files that are deleted in 30 days. Just find the data you want to retrieve and tap on Restoreto recover them. Here if you are using a computer, you can go to drive.google.com/drive/trash directly to look for the Google Drive Trash and restore the deleted data. Then, what if you have cleared the Trash and permanently remove the files from Google Drive? In this case, if your Google account is associated with a company, school or group, you still are able to get them back- ask an administrator to recover the deleted Google Drive data. But you should know that the administrator can retrieve files that are deleted within 25 days only. Step 1. Login to Gmail and then enter the Management Settings. Step 2. Choose the user and double-click to open his/her profile. Step 3. Open the Menu by clicking on its icon at the top right corner. Step 4. Finally, elect Restore Data and select the files to recover. Here is another way to extract the Google Drive files that are permanently deleted- ask Google Drive Support team to help you. This means is effective especially when the files are missing from Google Drive for unknown reasons. When the Google Drive folders become empty suddenly, you can contact Google Support team to get the missing files back. But also, the team can restore files that are missing or deleted within 25 days also.